On July 9th, Otgon Yondon introduced us to Mongolian tea and traditions. 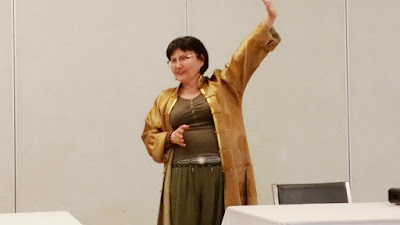 Nomadic culture is alive and well in Mongolia, consisting of a large portion of the population who do not live in the capital city of Ulaanbaatar. Since nomadic life is centered around livestock, where the animals go, the families will follow. Mongolia experiences approximately six months of winter, with Ulaanbaatar being the second coldest capital in the world, and very hot summers with temperatures averaging around 40°C (104°F). For this reason milk and meat are essential to the national diet. Due to climate, tea is not grown in Mongolia. Most tea is imported from Georgia while previously it had been imported from India. Suutei tsai (milk tea) is the traditional beverage in Mongolia and is usually prepared with green tea, milk, and salt. Each region of Mongolia uses the same basic tea recipe with variations on ingredients. Southern Mongolia prefers salted teas, Western Mongolian tea tends to be more salty, and Eastern Mongolians tend to prefer tea with no salt. Sometimes tea is prepared with dried meat and other filling ingredients, with the result resembling a meal more than a beverage. In Springtime, the meat might be replaced with dumplings. For this event, Otgon prepared the heartier version of tea using green tea, dried beef, rice, milk, and salt. The tea has an aroma of meat and buttery cream with a mild buttery and savory flavor. 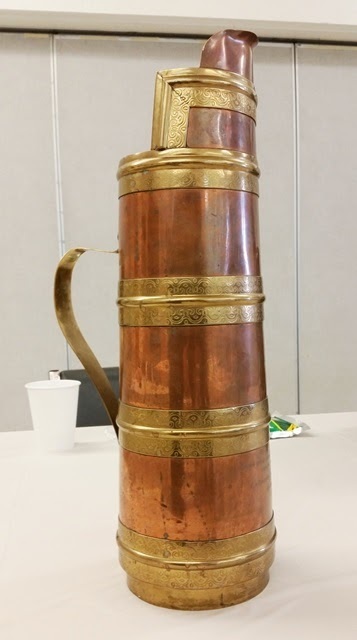 Mongolian tea urns (kettles), cups, and spoons are covered in copper. Traditional tea urns are rarely found outside Mongolia because they are a cultural treasure, so modern tea urns like Otgon's look traditional on the exterior and have a thermos-like interior. The copper is believed to provide a healthy supplement to counteract the heavy Mongolian diet. Tea is not cooked in the kettle, but it can be kept warm on a stove. 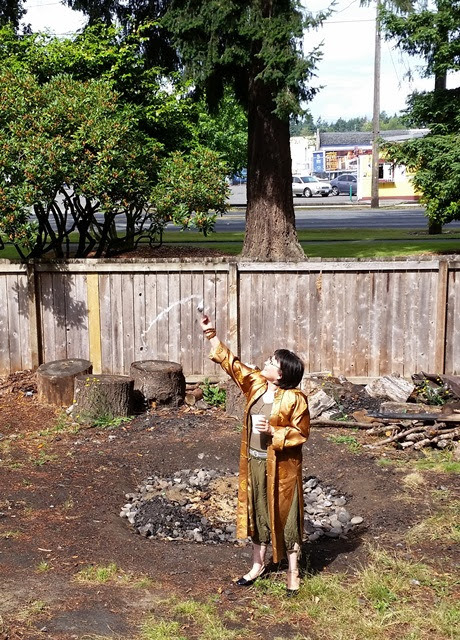 The first serving of tea is traditionally offered outside to the four directions, paying respect, greeting, and giving thanks to nature and to ancestors. Following tradition, men are served first. Tea is offered with the right hand while the left hand supports the right wrist. 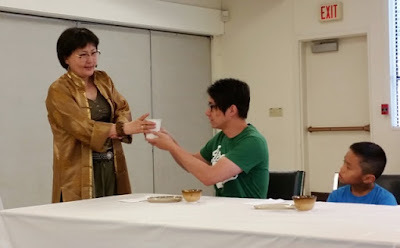 The timing for this tea experience was auspicious as the celebration of Mongolia's independence would take place July 11th through 14th (celebrated July 10th in North America). In Mongolia, the celebrations would include wrestling, horse riding, and archery. Many thanks to APCC for making events like this possible and to Otgon for sharing the tea and traditions of Mongolia!